The reignited volcano features 25 Meyer Sound MILO line array speakers (inset) clustered in stacks of two, three, or four boxes strategically placed throughout the lagoon. implementation of a Meyer Sound system. “When we started this project five years ago, we decided it was not going to have an organic soundtrack like the last one,” explained Jim Doyle, director of WET Design. “It was going to be a piece that bridged the centuries at the same time could musically stand on its own.” WET subsequently approached the Greatful Dead’s Mickey Hart, who brought along with him the design firm’s other top composer/musician choice, Zakir Hussain, to create a sixmovement composition. 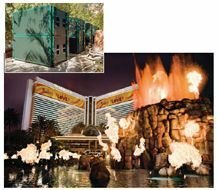 Transporting the immersive qualities of the Meyer Sound system recently installed in the Mirage’s new LOVE Theater to the outdoor volcano attraction was the work of Audio Dimensions. The resulting sound design relies on multiple point sources to engage listeners on either side of the volcano’s lagoon in front of the hotel. It features a total of 25 MILO line array loudspeakers, clustered in small stacks of two, three, or four boxes strategically placed throughout the lagoon. The loudspeakers are custompainted green to blend with the foliage, and largely hidden behind false rock façades that provide camouflage and weather protection. Each stack also has itsown dedicated 700-HP subwoofer, along with several others on the island. A Matrix3 audio show control system allows the image of the music to be manipulated over 180 degrees. Signal processing is handled by a Galileo loudspeaker management system. “The music travels over a large reflective pool of water, which requires a fair amount of power,” noted Brad Cornish of Las Vegas’ Technology West Group. “That water is being blasted by jets of flame. Between that and the natural desert heat, we’ve essentially created a microclimate, giving us an exceptionally high level of humidity to pass sound through. It calls for a lot of power and some rather unique and meticulous system tuning.” Under the water, the signal runs over fiber in PVC pipes to avoid potential interference from the adjacent gas jets and circuitry.